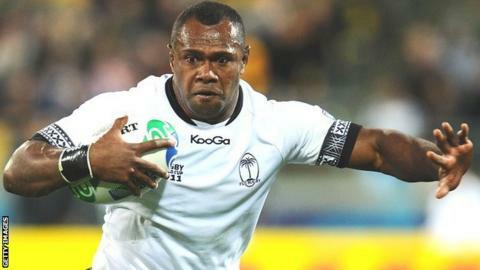 Leicester Tigers have all but sealed a deal to sign Fijian wing Vereniki Goneva from French club Tarbes. The 28-year-old, who can also play at centre, has been in discussions with the Tigers for several weeks. Leicester director of rugby Richard Cockerill said: "We are a long way down the line. It's pretty much done and we are just sorting the details out." The club have already agreed deals to sign backs Miles Benjamin, 23, Adam Thompstone, 24, and Dan Bowden, 26. Tigers are yet to announce the deals but BBC Radio Leicester understands the terms are agreed and Worcester wing Benjamin, and London Irish duo Thompstone and Bowden, will be part of the Welford Road squad next season. Tigers will be losing Gloucester-bound Billy Twelvetrees, Argentine wing Horacio Agulla, George Skivington and Alesana Tuilagi next season and Cockerill was delighted to be on the verge of adding Goneva to the ranks. "He is a raw talent but we are losing some raw talent so we have to go out into the marketplace," Cockerill added. "We are not in the financial game of buying recognised stars because they are very, very expensive."